Christ Glorified in the Court of Heaven, attributed to Fra’ Angelico, ca. 1424, courtesy National Gallery, London. The saints and martyrs of Christendom have been a frequent image in Western art throughout the centuries. Many of us descend from the women and men such art depicts. On All Saints’ Day, Christians honor all saints, both known – many of them commemorated throughout the liturgical year – and unknown. The date has been fixed on the first of November in the Catholic Church, often transferred to the first Sunday of the month by churches within the Anglican tradition and in other mainline Protestant churches. 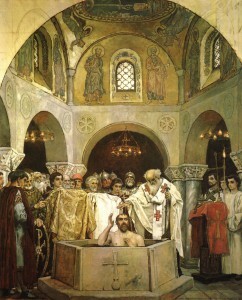 (An earlier Catholic observance, and the Orthodox observance shared by Catholics of Byzantine and Oriental Rites, uses the first Sunday after Pentecost as the date.) Commemoration of the saints dates perhaps to the Apostolic Era and was certainly generally practiced by the fourth century, when mass martyrdom of Christians made too many saints for each to be individually remembered throughout the year. 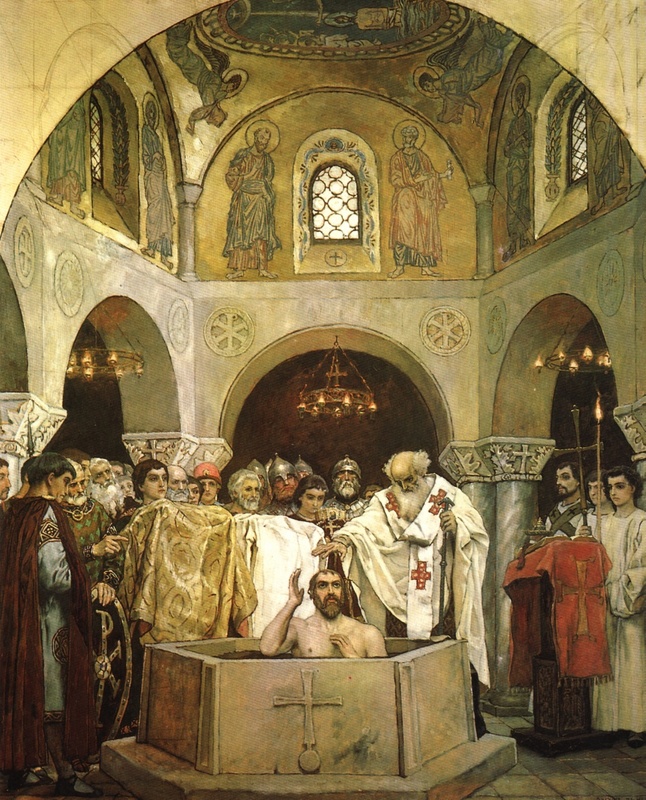 Our Judeo-Christian faiths share a wealth of genealogies – of nations, as in the peopling and successions of cities (and nations) in the Ancient World found in the Hebrew Scriptures, and of human beings, found in both Testaments of the Bible and in their most accessible form in the book of St. Matthew the Evangelist. Given that such knowledge was either orally transmitted or compiled long after it was current, biblical scholars, anthropologists, and others continue to debate how much of such genealogies can be verified in documentary sources and the archaeological record. In the Christian era, men such as St. Jerome and the “the Venerable” (St.) Bede produced the genealogical content of their eras, often at a time when hagiography was as desirable as accuracy. Many genealogists today and others with interest in their ancestry hope to trace “gateway ancestors” or others of royal descent. Yet these same gateway ancestors, and others whose ancestry is traced in genealogical journals (several of these are available on AmericanAncestors.org – select these in the database search fields), share Medieval ancestry that is traceable to a number of historic saints. Laurence Flanagan, A Chronicle of Irish Saints (Belfast: Blackstaff Press, 1990). Many of these are traceable ancestors for Americans of colonial descent through gateway ancestors and those of more recent Irish and other British descent alike. As the second-century B.C. book of the prophet Tobias (or Tobit) notes, “[We] are the children of saints, and look for that life which God will give to those that never change their faith from Him.” He was not speaking figuratively. Many of us today count these saints among our ancestors. See, for example, David Faris’s Plantagenet Ancestry of Seventeenth-Century Colonists and Gary Boyd Roberts’s The Royal Descents of 600 Immigrants to the American Colonies or the United States. Thank you for this post, Christopher. I too descend from a few dozen sainted individuals, but my favourite ancestor is St. Elisabeth of Hungary (1207-1231), ancestor of the Landgraves of Hesse (who were among my German grandmother’s ancestors). Her credo was “We must make people happy”, and that’s what she spent her short life doing. She was the very model of active compassion. Nicely done Christopher. Let us strive to remember them all, known and unknown, as surely they represent what might be considered the best in all of us. For myself, here’s to St. Margaret of Scotland – to whom so many of us are deeply indebted. Very interesting and incredibly well done! Thank you for this extremely timely post. I’m not, to the best of my knowledge, descended from St. Olaf, the martyred Norwegian king. He’s generally considered responsible for both Christianizing and consolidating the warring sub-kingdoms of Viking Norway, about 1000 CE. A church was founded on the site of the battle in which King Olaf died. The current church dates to about 1180. Many of my ancestors were baptized, confirmed, or married in this church, in Stiklestad, Verdal, Nord-Trøndelag, Norway, not far from Trondheim. I’m not lucky enough to have visited this small country church. It’s is a big tourist attraction as well as being an active church to this day. Thank you for a most interesting article! It looks like St. Margaret of Scotland is one of my ancestors, if what I’ve found on Ancestry.com is reliable. In another line, it would seem I descend from Charlemagne, which would also mean descent from Pepin of Heristal and his concubine Alpaida. I almost hope that is not so because Pepin is directly responsible for the martyrdom of St. Lambert, bishop of Liege, who forbade Pepin’s divorce from Plectrude (Alpaida’s sister). Small world, I’ve served as director of music at St. Lambert Church in Skokie, IL, for 27 years. Perhaps this is indicative of God’s sense of justice or His sense of humor — maybe both!